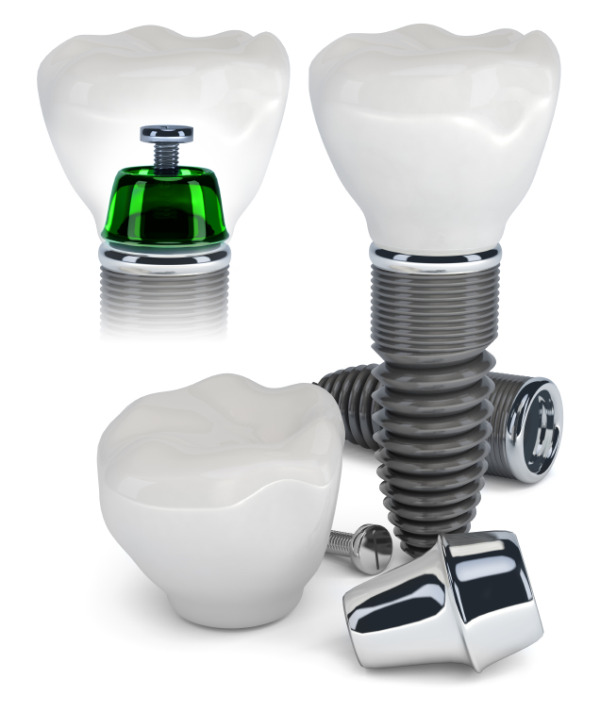 Dental implants provide a long-lasting solution to missing or badly damaged teeth that require extraction. Dr. Choy is pleased to offer stable restorations with dental implants in Honolulu as part of our comprehensive dental services. An implant procedure involves placing a titanium rod directly into the jawbone through one or two surgeries. The rod is implanted at the site of a lost or extracted tooth and acts as a prosthetic tooth root to help stimulate healthy jaw bone density. We determine exactly how and where to place the implant through a thorough exam and advanced imaging techniques. Most patients can return to work the same day as your surgery. During the healing process, the bone grows around and fuses with the rod – a process called osseointegration, which can take up to six months. After the dental implants rod has stabilized, we top it with a dental crown that is custom made to blend seamlessly with your smile. Dental implants require that you have sufficient healthy bone in your jaw to secure the rod, and that you're healthy enough to heal well. Dr. Choy will evaluate you personally to determine whether you are a good candidate. • No shift or clicking: Your dental implant is securely anchored in your jaw, offering normal bite strength with maximum stability. • No shifting of adjacent teeth: When there is a gap in your smile, your existing teeth will attempt to close the space. The placement of a dental implant prevents your teeth from shifting in their alignment. • No bone loss: Without your natural tooth root to stimulate your jaw bone, the density of this material can diminish, affecting the shape of your face. These advantages not only let you talk and chew more easily, but also boost your appearance and give you a better overall quality of life. Dr. Choy is a highly experienced and most credentialed clinician in Hawaii with decades of experience in implantology and restorative dentistry. Dr. Do's renowned success in the area of cosmetic dentistry further supports natural and durable results. Working closely together, Dr. Do and Dr. Choy look for the big picture around the implant procedure. They understand that the placement of a tooth ties into many other issues, such as jaw alignment and TMJ, and are committed to taking a comprehensive approach. An implant is such a rewarding treatment that it should not be evaluated by where a missing tooth is, but by how the implant tooth will function correctly within the entire mouth. Our implant procedures include single implants, multiple teeth replacement, mini implants, and full-mouth restorations with All-on-4. Whether you need a single or multiple implants, our primary goal is to restore as much functionality as possible, taking into consideration elements such as gum health and wear on your teeth. We educate our patients about what to expect with implant treatment and how to care for their implants properly. We're able to complete all parts of the implant procedure right in our comfortable office, which is equipped with the best in modern dental technology. Our focus on establishing positive relationships with our patients and doing work correctly the first time guides us every step of the way--helping people is what it's all about! Make Your Dental Implant Appointment Today! If you're ready for a long-lasting, beautiful solution to your missing or damaged teeth, call our office and make your implant consultation appointment today. We happily provide dental implants in Honolulu, Manoa, and for patients from all over greater Hawaii.